The Devilgotchi or Tamagotchi Devil is one of the most coveted tamas ever released. It was released in Japan only in 1998, and came in four colors; white, black, pink, and purple/white. Today, this sought-after tama can go for as much as $300 a piece. 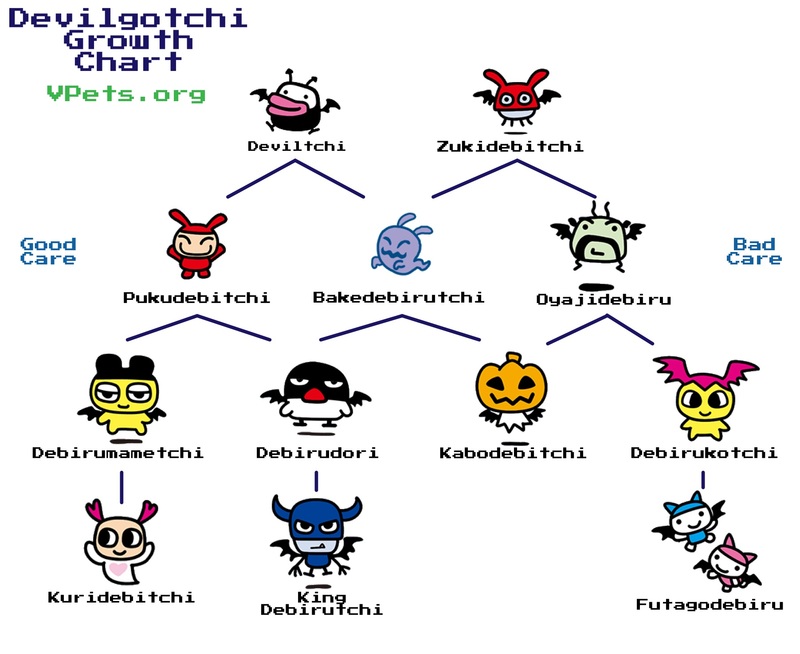 The Devilgotchi is considered the counterpart to the Angelgotchi. The Angelgotchi allows players to raise an angel, while the Devilgotchi has a devil. The Tamagotchi Angel was released in both Japan, North America, and Europe, but the Devil was only released in toy form in Japan. The Tamagotchi MonsterJava app was available for old flip phones for a while in many countries. When you startup your Devilgotchi, you will see a black bat flapping on the screen. Press the B button to go to the time screen. Use the A button to set the hour. Use the B button to set the minutes. Press C when you have entered the correct time. The bat will fly on the screen for few minutes, then your devil will appear. Your devil will start out with empty hungry hearts (stomach), two happy hearts (friendliness), and 40 DP (devil power). The status menu will show you information about your devil. You can see the age, stomach, happiness, and devil power. You want to keep the devil power score as low as possible. You lower the score by disciplining your devil when it is misbehaving. The food menu allows you to feed your devil. The pie will fill one hungry (stomach) heart. The chocolate will fill one happy (friendliness) heart. The game icon will let you play a game with your devil. Help your devil catch eat stars. You can hit the A or B button to release a star on the left or right side of the screen. Time the drops so that your devil will catch the star in its mouth. Each successful game will gain one happy heart. When your devil poops, you need to clean it up. Use this icon to clear the screen. Your devil is a demon, after all, so he will misbehave often. When the screen turns black, your devil is misbehaving. Select this icon to discipline him. The higher your devil's devil power is, the more often it will misbehave. Each time you discipline your devil, its DP will drop 10 points. Sometimes your devil will call you and extend its hand. It wants to be friendly and shake your hand. Select this icon to shake hands, lower devil power, and increase happiness. Each time you shake hands when your devil asks, it will lower its DP by 10 points. Your devil will need you to turn out the light when it goes to bed. Use this option to turn the light off. The light will automatically turn on when your devil wakes up. When your devil needs something, it will call for you, and this icon will light up. Hit the B button on the character screen to go to the clock screen. Press the A and C button simultaneously to enter the set time mode. Use the A button to set the hour, and the B button to set the minutes. Press C when you have entered the correct time. Press B to go back to the character screen. On the character screen, press the A and C buttons simultaneously. Press again the turn the sound back on.